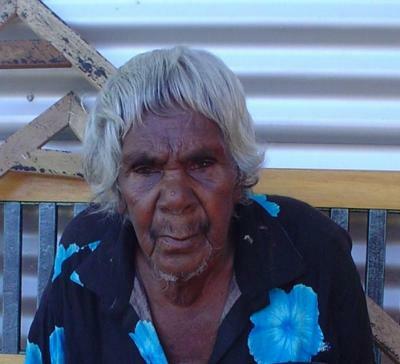 Minnie was born around 1910 near the cattle station of Utopia in Northern Territory. She belongs to the Anmatyerre and Alyawarr language groups. She is the mother of acclaimed artist Barbara Weir, a daughter she had with pastoral station holder Jack Weir as a teenager. She later married Motorcar Jim and together they had six children. Like many other highly respected Utopia women artists, Minnie participated in the batik project which was introduced to the community in 1977. Painting on canvas in the community started in the late 1980s. In 1999, after many years of ceremonial body painting, Minnie started to paint on canvas. Minnie soon attracted a large following, holding her first solo exhibition in Melbourne in 2000. Her knowledge of and her spiritual connection to the land is clearly evident in all her paintings. Together with her good friend Emily Kame Kngwarreye Minnie revolutionized Aboriginal Art by painting in a radically different manner than their fellow artists from the Western Desert. This different manner became extremely successful in the market place with a Western audience due to its colourful and abstract appearance. Minnie's style was spontaneous, using "bold" and "vibrant" colour, and executed with great freedom. Her paintings include two main design themes. The first is free-flowing and parallel lines in a pendulous outline, depicting the designs used in women's ceremonies. The second are circular shapes, used to represent bush tomato, bush melon, and wild desert orange. Minnie continued to paint until she died in March 2006. Her paintings are held in many overseas institutional and private collections as well as the major art galleries in Australia. 2009 Indigenous Australian Painting, Metropolitan Museum of Art, New York. 2005-03-02 National Aboriginal and Torres Strait Islander Art Award. 2000 Solo exhibition, Flinders Lane Gallery, Melbourne, Australia.